This edition of the Култура/Culture journal, as several of the upcoming issues, is dedicated to the topic of CULTURAL MEMORY. 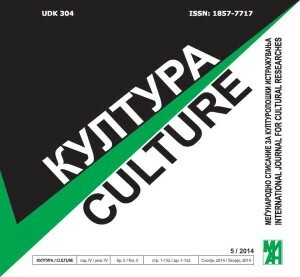 The editorial board felt compelled to publish a selection of the papers presented at the First International Conference of the Center for Culture and Cultural Studies, which took place in Skopje (Macedonia), between September 5th and 7th, 2013. The conference was held with a singular goal in mind: to allow researchers from across the scientific disciplines to engage in meaningful debate and discourse on the vast topic that is cultural memory. In turn, over 300 papers were presented, stemming from/across distinct disciplines, while at the same time, successfully practicing a heightened interdisciplinary approach. Henceforth, offering a selection of papers that strictly define a singular cultural memory approach is simply impossible. The editorial board thus tried to offer a way into categorizing the papers, yet any one strict categorization could neither prove sufficient nor exhaustive, since most papers immediately and apparently addressed several categories, while some eluded any.